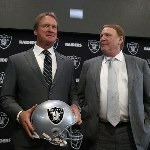 After bringing head coach Jon Gruden back many fans are optimistic that the Oakland Raiders can reach the postseason once again but thinking playoffs may be a step ahead too soon as the Raiders need a lot of work after what was perceived around the league as an underachieving season. Oakland, after all, has not made a lot of noise this offseason during the free agency period and the other division teams are also reloading. In other words, expect the Raiders to have a lot of competition not only from other conference powerhouses but also from within their own division as well as the AFC West will most likely be a very good and tough division to play in. The Los Angeles Chargers are probably a good draft choice away from being division-title contenders and are very close to being a really good team if they add a couple of good players in key positions. The Kansas City Chiefs traded away Alex Smith last year, but they believe they made the right choice by making the transition to Patrick Mahomes as they are really optimistic about the second-year quarterback and firmly believe he will only make them better. The Denver Broncos will definitely improve on last year’s season as they finally seem to have found their quarterback of the future after acquiring former Minnesota Viking Case Keenum in free agency. Expect the Broncos to finally leave behind the futility of the battle between Brock Osweiler, Trevor Siemian, and Paxton Lynch. The conference competition is fierce as well. The New England Patriots, Pittsburgh Steelers are perennial playoff contenders and teams like the Tennessee Titans and Jacksonville Jaguars made huge strides, but if the NFL is known for something, is its unpredictability. The Raiders, however, have made some key signings in the secondary, which was a huge problem for them last year so don’t count them out as it would be foolish to underestimate Gruden and his leadership. He will try to inject new energy into their offensive system, change their locker room culture and get them to buy into his system and motivate them to play for him, themselves and the club. If Gruden accomplishes that, the Raiders get a good draft to fill their needs at linebacker and further solidify their secondary, they may have a chance at making the postseason.